The Royal Cosmonautical Society, from Chromosphere Games (game site) is a new entry in the sparsely-populated gravity-based spaceship genre, accompanied by titles like Gravitar, Lunar Lander, and Thrust. Unlike most other genre entries, there is no fuel management, so players are free to thrust all they like... but that doesn't make the game easy by any stretch. 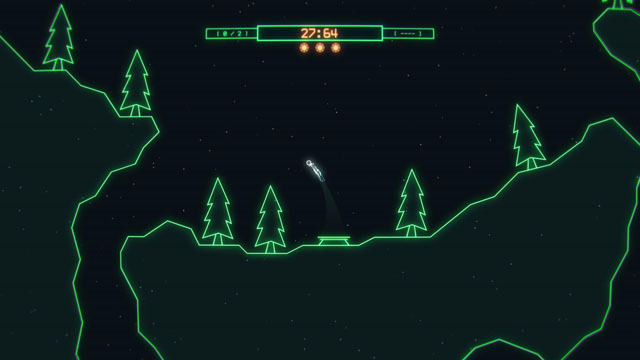 Players must navigate through a variety of environments across 10 planets, and new gameplay is introduced in each. In some areas, players simply need to make it to the landing pad alive, while other areas see players dodging mines and heat seeking missiles, powering down engines while passing through explosive gasses, sliding along on ice sheets, or diving underwater. Some planets even allow the use of special equipment, including a tow rope that lets you carry objects (while fighting the extra pull of gravity), a shield that lets you bounce off walls and pass safely through laser beams, and a grappling hook that lets you fling yourself around corners at high speeds. The game is now available for PC and Mac via Steam, Humble Store, and Itch.io. Check our coverage here.